Options Natural Flea & Tick Shampoo, 12 fl. oz. Kill fleas the natural way with Richard's Organics Natural Flea & Tick Shampoo. It's formulated to kill fleas and repel mosquitoes without the use of harsh chemicals for up to 4 weeks at a time. Use with Richard's Organics Whole House Premise Treatment for a complete Flea Free system. It's safe to use around your kids and works for dogs over 12 weeks old. 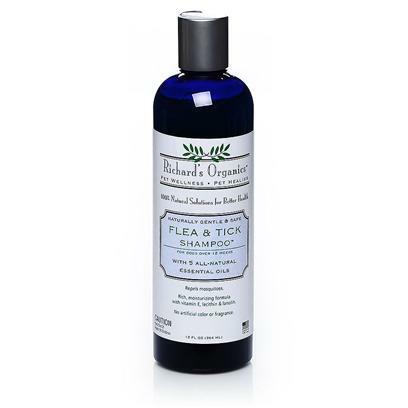 Richard's Organics Natural Flea & Tick Shampoo helps soothe irritated skin with Chamomile and Aloe Vera extracts and contains no artificial color or fragrance. Keep out of reach of children. No known side effects. Avoid contact with eyes, nose, and mouth. Peppermint oil, eugenol, clove oil, cedar oil, cinnamon oil, rosemary oil, inert ingredients. With natural ingredients and pure essential oils. Sulfate and paraben free. Beginning at the tail and working toward the head, spray pet's coat thoroughly to insure penetration through to skin. Attention should be paid to legs and feet and area under the tail. Coat & skin should be damp. Towel dry if desired, but do not rinse. Avoid contact with eyes, nose & mouth. Safe for frequent use. Reapply after bathing. Safe and effective & doctor recommended.